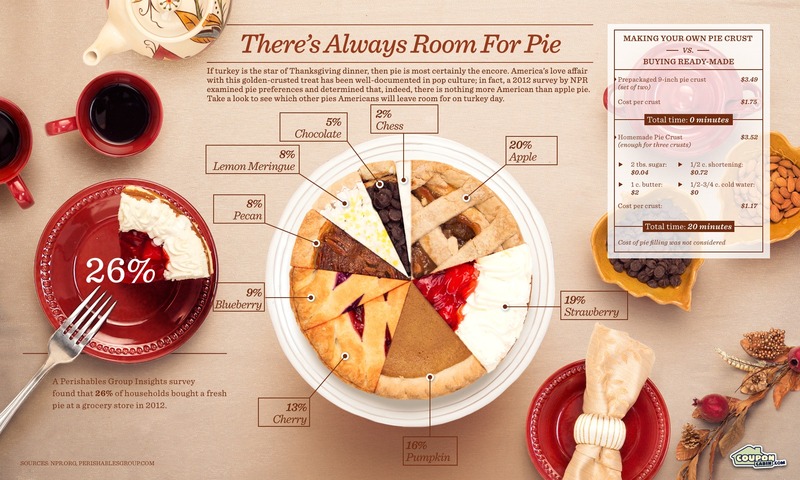 A look at the top nine pie types Americans are enjoying this Thanksgiving. Here's a confession: I'm not a huge fan of turkey. Not a huge fan of mashed potatoes or cranberries or buttered things, either. What I do love -- and I mean love -- about Thanksgiving, though, is the dessert. Keep your oversized birds and your baby food side dishes. Sit me down with a hot, hunking piece of apple pie a la mode and I'm set for the winter. Apparently, the first pies were filled with meat and called coffins, which could either be a total misnomer or completely accurate (probably both). Mini, sliced and half pies make up 24 percent of pies bought. Yay portion control. Recent growths in popularity for blueberry and cherry pies can be attributed to the public's desire for antioxidants. Because nothing screams "healthy" like your third slice of blueberry pie. Pies are slowly starting to challenge cupcakes for title of "trendiest dessert."